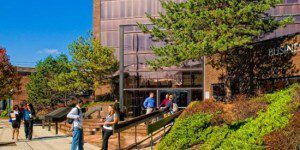 The Rutgers University Professional MBA (PMBA) is an accelerated part-time program that runs for 21 months. In total, students complete 42 credits throughout seven sessions that each runs for 10 weeks, and students take no more than two courses per session, with all classes running from 8 a.m. to 5 p.m. on Saturdays. In addition to class time, the program also includes a mandatory international residency. There are no less than 58 students in the current RSBC Professional MBA cohort, of which are around 40-years old and have more than 15 years of work experience. About 71 percent of students from the RSBC Professional MBA program are promoted within one year of graduation. Tuition for the Rutgers University Professional MBA program is a flat rate for both in and out-of-state students at $67,900. This includes all costs for textbooks, administrative fees, parking, materials, and the international residency, though airfare and meals are excluded. The Rutgers University Professional MBA specifically requires prospective students to have completed at least three years of professional experience. To be considered for admission to the Professional MBA program, applicants must complete an online application form, pay a non-refundable $70 application fee, and submit the following: all academic transcripts, GMAT or GRE scores or MCAT or LSAT scores if applicable, a résumé, a personal statement regarding an applicant’s goals, and two letters of recommendation. The admissions office requests that one of the letters be written by a current, or immediately previous direct supervisor. The committee offers interviews to select applicants by invitation only. Finally, upon request, the Associate Dean of Graduate Programs may provide a standardized test score waiver to applicants whose work experience is deemed exceptional. GMAT waivers are available for all RSBC programs for qualified students. Applications are admitted on a rolling basis.